Less maintenance. More uptime. Reduced maintenance costs. Standard industrial batteries require normal watering maintenance every 1-3 weeks or about 16 to 50 times per year. 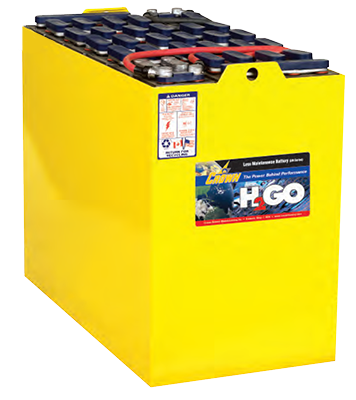 With H2GO by Crown Battery the intervals between watering are 9-12 weeks depending on application and usage. That means watering your batteries only 4 to 8 times per year which reduces the amount of time you spend watering batteries and doing more of what you do best…moving more products! Modified alloy reduces gassing which improves water retention. Innovative paste additive improves skeletal structure for better active material utilization also improving charge acceptance. Recombinant vent cap captures liquid from emissions and “re-introduces” back into the cell requiring less water. Advanced separator material improves charge acceptance which reduces water consumption. Add water as needed – do not overfill. Always keep electrolyte level above separator protectors. Keep vent caps tightly in place. Charge battery on properly matched charger. Allow battery to cool down before placing it back into service. Keep battery top clean, dry and free of foreign objects. Keep battery and truck cover open during charging. Batteries produce explosive gases, keep flame and sparks away from battery. Do not discharge beyond 80% (1.140-1.160 SP.GR.). Report any problms or damage (minor problems can become major ones). Good battery care is not a luxury, it’s a necessity! The electrolyte level must be kept 1/4” below the bottom of the vent opening and above the separator protector. LED electrolyte level monitor indicates when watering is required. Optional automatic single point watering systems are available. Does not require a special charger. Optional on-site watering programs available. Recommended watering intervals of 9 to 12 weeks. Available in all 85 and 125 amp sizes. Delivers the same power as our standard 85 and 125 amp batteries. Utilizes a recombinant flip top vent cap to minimize water emission. Offered with a 5 year warranty.